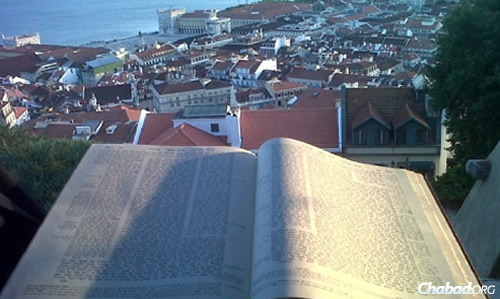 Like many in the small Jewish population of Portugal, Selwyn Berg regularly reads the weekly Torah inspiration—called “Letter From Lisbon”—emailed by Rabbi Eli Rosenfeld. Berg, a native of Rockaway Beach, N.Y., who lived in San Diego for a time, resettled in what he calls the “Shangri-la of Portugal” about 10 years ago, and is quick to offer guidance to potential tourists. It’s a curious invitation, considering Portugal famously expelled its Jewish residents in the 15th and 16th centuries. 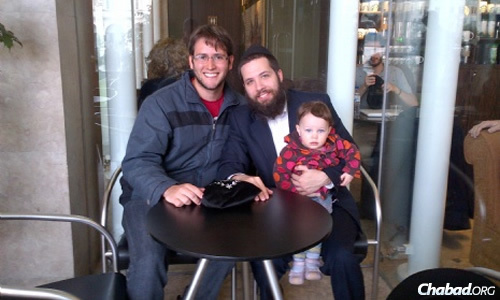 Rabbi Eli and Raizel Rosenfeld arrived in Portugal at the end of 2010, the first full-time Chabad-Lubavitch emissaries in one of the few countries at the time that had yet to see a permanent Chabad House. They now run Chabad Lubavitch of Portugal out of Lisbon and Cascais, reaching out to Jews of all backgrounds, locals and tourists alike. The rabbi says there is a beautifully restored synagogue—Shaarei Tikvah—as well as a newly restored mikvah and a very active community, made up of both Sephardic and Ashkenazic Jews in many professions. 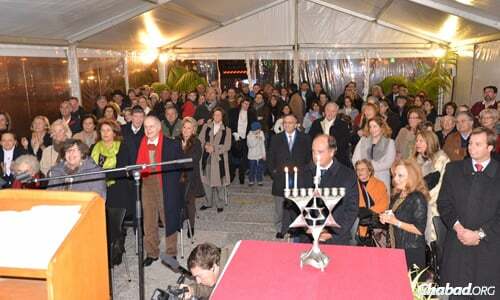 Public events like the menorah-lighting above are magnets for Portugal's Jewish community. Today, Jewish people in Portugal make it a point to join each other for holidays and other celebrations. In addition to women’s programs and an ongoing kosher lunch-and-learn, the Rosenfelds continue to fuel Jewish pride weekly at their Sabbath table. While the local grocery store carries staples needed by those who keep kosher, the Rosenfelds have many products shipped into the country. It took a long while for Jewish life of any kind to return to Portugal after the 15th-century expulsion. The Jews of Lisbon have had a continual officially recognized presence in the Portuguese capital only since the early 20th century. He explains that Portugal has a long Jewish history, but its public celebration of Judaism has not been the same since the infamous expulsions of the 15th century. In fact, in Belmonte, in northeastern Portugal, there is still a community of hidden Jews who were able to maintain their Jewish identity in secret until today, says the rabbi. According to some statistics, a quarter of the country’s population has Jewish ancestors. For the Rosenfelds, Lisbon holds special interest because the city was the point of departure for the Lubavitcher Rebbe—Rabbi Menachem M. Schneerson, of righteous memory—when he escaped Europe in 1941 on the Serpa Pinto, which sailed from Lisbon for the United States. The rabbi’s weekly email includes commentaries of past great Jewish rabbis who either lived in or traveled through Portugal. 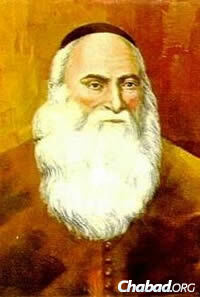 The Middle Ages saw the famous Jewish philosopher and Bible commentator Isaac ben Judah Abrabanel (1437-1508)—known simply as “the Abarbanel”—grow up in Lisbon, born into a distinguished Iberian Jewish family. He also served as a statesman and financier. Then there was Rabbi Abraham Saba (1440-1508), who took refuge in Portugal during the time of the Spanish Inquisition, only to be forced to flee again when Jews were expelled from Portugal. 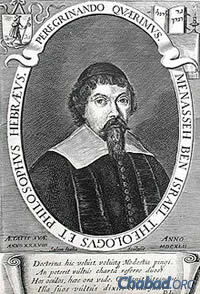 Another key individual was Manoel Dias Soeiro, known by his Hebrew name Menasseh Ben Israel (1604-1657), who was born in 1604 on the Portuguese island of Madeira. He was a rabbi, Kabbalist, writer, diplomat, printer and publisher, as well as founder of the first Hebrew printing press. The rabbi explains that Portugal is unique in that Judaism has played a significant and longtime part in the nation’s history, with most people recognizing the tremendous contributions of the Jewish residents. That’s why he tries to offer inspiration via his weekly emails using examples at hand. Rabbi Eli Rosenfeld, with daughter Sara in tow, helped a Brazilian visitor wrap tefillin in Rossio Square in downtown Lisbon.